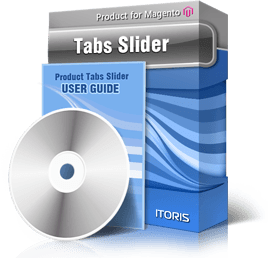 Product Tabs Slider module creates a modern tabular interface on your products’ pages, thus organizing all products’ information in a well-ordered way and making it more user-friendly. This Magento tab extension is a great way to make things easier for your customers, search engines and you! Your customers no longer scroll pages down and down to find all products’ information - all organized and provided in a tabular interface. You can set tabs to be changed on click or on hover. No extra coding for you to create tabs - the module will use standard Magento product blocks and create tabs from them. If your layout has no blocks - they can be declared there. Each tab has a unique anchor, so you can copy URL and point your customers to a selected tab on products’ pages. You can create standard tabs that will pull data from products’ attributes, as well as custom tabs, where you can add any content you wish - texts, images, links, videos, even Magento widgets. Please see our demo with contact form and Questions/Answers functionality inserted into tabs. Moreover, you can create a separate set of tabs for each store/storeview, as well as change tabs for each product individually (add unique tabs or exclude some standard ones). Scrolling for tabs appears automatically when there are more tabs than the page can display. There is a way to select where in your layout the tabs should be displayed with primary tab. Pre-created responsive design schemes (ideal for mobile and desktop templates) to meet your website’s look as well as ability to switch beautiful sliding effect when tabs are changed - all this allows adding and designing tabs literary in minutes for your stores. Search engines still index all your tabs, so no information will be lost for search engines. You can make tabs available for selected customer groups only. Also you can create tabs visible for the customers who have purchased the product or for those who have not purchased this product yet only. There is a User Guide available as well. You can read it online or download as PDF.